Lavender plants provide a soft, purple color and a strong, distinctive smell to the garden or home. The plant’s oils are commonly used in aromatherapy and the plant itself has medicinal benefits in some herbal remedies. Lavender traditionally grows in warm, dry climates, so those planting elsewhere may face difficulties with feeding, watering and generally caring for the plant. If your lavender is looking poorly or damaged, try a few remedies to bring it back to life. Trim overhanging branches or remove awnings or other causes of shade near your lavender plant. Lavender requires direct sunlight for at least eight hours every day to thrive. Refrain from watering your lavender plant for a week. 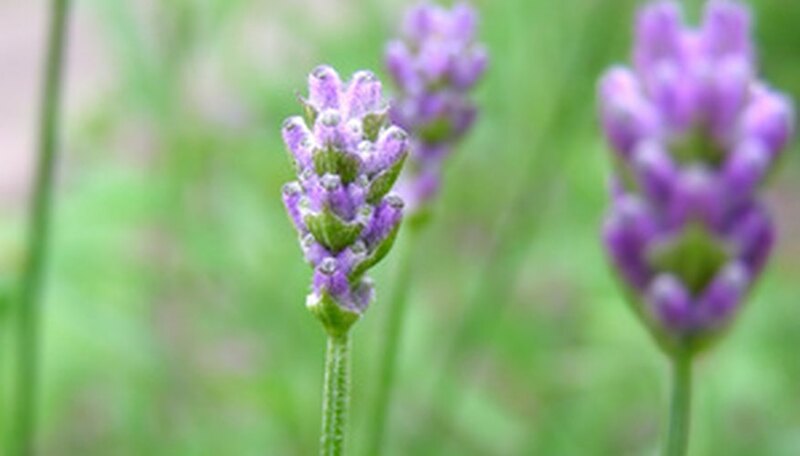 Lavender grows best in dry conditions and excessive moisture in the soil can lead to root rot. Water lavender only when the top two inches of soil are dried out. Do not water if it has just rained enough to provide for the lavender. Mix compost, peat moss or another organic amendment into the soil around your lavender plant. These amendments will allow for better water drainage out of the soil. Prune back your lavender by half twice per year, just after harvest in the spring and fall. This heavy pruning will remove dead or damaged parts of the lavender plant and will encourage new and healthy growth. Eliminate all weeds near your lavender plant. Weeds compete with the lavender for water, soil nutrients and sunlight. Replant lavender in fresh, well-draining potting soil once per year. Choose a sandy potting soil or use a mixture of half regular potting soil and half soil for cactus. Use a container that features many drainage holes in the bottom to allow for excess moisture to run out. Mix 1 tbsp. of dolomite into the potting mix to increase drainage. Move the potted lavender plant into direct sunlight. Move the lavender through your house during the day as the sun rises and sets. It needs as much full sunlight as possible--eight hours at least. During the summer, place the pot outdoors in direct sun. If necessary, use fluorescent grow lights to simulate the needed sunlight. You will need to provide at least 14 hours of fluorescent light to duplicate the sun. Water the lavender only when the top two to three inches of soil feel dry to the touch. Allow it to dry out in between watering times. Fertilize the lavender with organic compost every six months. Follow specific product instructions regarding application rates.